Note: The Email Message Center does not act as an inbox. To view messages you have received, you must access your personal email. 5. You are now on the Club Communication screen. Here, you can compose emails and view emails you may have sent. Note: Only Club level access "30 - Site Administrator" can see "Show All Emails" and "Show My Emails Only". If any other member views this page it will only display their own emails. 5. To review one of the emails you have sent, click on the View button next to the appropriate email. You may also view the email Stats, Resend the email, Make a Copy of the text , or Delete it, using the buttons on the same line. Note: If you use the Resend link it will let you edit the email but not remove or add recipients. If you need to change the recipients please use Make a Copy. 6. If you have a draft email in progress, you may open for editing or delete it by clicking the Open or Delete buttons next to the relevant message. 7. To create a new message, click on the orange button marked Compose New Message just above the email view field. 8. You are now on the Create Email page. Here, you can compose a message to your fellow club members or non-member friends and contacts in the club database. 9. Follow the steps on the screen to compose a new email. 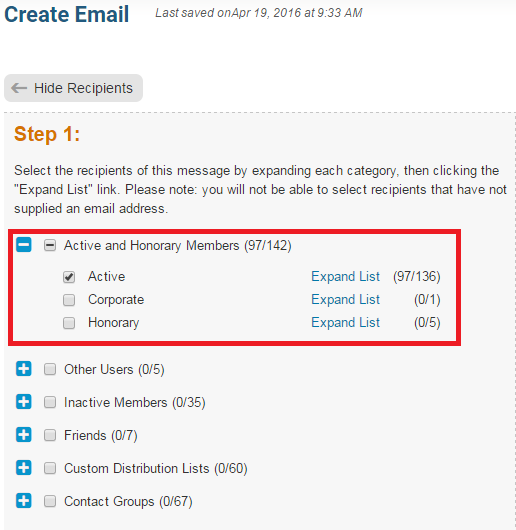 First, you select the recipients by clicking on the buttons to expand the member lists. You can select invidual members, or choose to send messages to everyone in a given list. In this case, we have selected to send our email to all the active members of the club. 10. Now, write the subject of your email in the space provided. 11. Your email is automatically generated with a greetings to the recipient that includes their first name and last name. You can change this information using the Insert Mail Merge Fields feature. This feature also allows you insert the recipient's name or other information in the body of the email. 12. For example, if you wish to refer to your recipient by first name in the body of the email, select Recipient First Name from the Recipient menu and click the Add button at the appropriate point in your email. This adds a piece of code, which tells ClubRunner to insert the member's first name from your club database when the email is sent. The person who recieves your email will see their name, and not the code. 13. Compose your message. You can use the buttons above the writing field to edit your fonts and text style, and to add images and links. 14. You now have the option to add a file attachment to the email. This could include photos or documents relevant to the email. To add a file, click Select Files for Upload. You can then choose files from your computer. The files cannot be larger than 6 MB in total. 15. Next, you have the option to Send a list of recipients as an attachment, and/or to send a copy to yourself, by clicking on the indicated check boxes. Attaching a recipient list lets your readers know who else has received your message. 16. You can choose to send your email immediately, or at the time of your choosing. To send the email now, leave the Send Right Now button checked, and click Send. 17. If you want to send the email later, select Schedule and enter the time and date you wish your message to go out. Then click Send, as noted in the previous step. 18. Finally, you have the final options for sending your mail. Click on the relevant button. Save as Draft: Will save all the details of the draft email (including recipients) so you can edit it later. Send to Myself: Will only send the email to the member that is logged in for verification purposes. Send: Will send the email to the selected recipients.